Justin Bieber boasts to a Rolling Stone writer that he has one of the world’s only black MacBooks, tying up a number of new rumors. Buried in the last bit of his Rolling Stone profile, Justin Bieber boastfully confirms a refreshed lineup of MacBooks that include a black edition–tying up with a number of new rumors. Swag. Speaking to writer Vanessa Grigoriadis, the 5’5″, 112-pound pop waif slings around his MacAir and casually laughs “mildly and then starts fiddling with his two computers, one of which he claims is the only black MacAir in the world” (a partial excerpt of the interview is online). Last week we wondered if Intel had leaked the upcoming MacBook design in an online ad (something it’s accidentally done before), and many of the details certainly tally with swelling rumors. One fact didn’t chime in tune, we thought–the Intel device was black, but Apple has recently moved past its history of colored computer products and centered on releasing aluminum-only editions, championing the efficiency and green qualities of the unibody machining process. But to distinguish its new PCs from peers and its older models, it’s highly plausible Apple could color a new line of MacBooks. One way to do this would be to anodise the metal chassis, and another way could be to swap the aluminum body for a colored alloy–remembering that Apple licensed novel metal technology LiquidMetal last year. 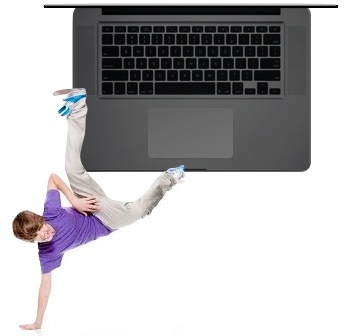 Bieber’s interview certainly adds a novel spin to this rumor … and we’re wondering if the mixup with the device name (“MacAir”) is simply a mixup by a non-techy journalist–was Bieber really toying with a pre-release MacBook Pro? And if so, why–is he promoting the tech? We know the MacBook range is due a refresh: The timing tallies with previous Apple schedules, Apple just refreshed its Air laptops, and these have previously led later MacBook Pro updates, and there are reports that supplies are drying up in stores. We’ve conjectured that the devices would be thinner, lighter, may ditch optical drives and possibly replace hard disks with solid state drives for the purposes of speed and power efficiency (a partial SSD swap-out would make sense, as Pro-users tend to need more drive space, which would be expensive in an all-SSD solution). Now there’s a strong rumor, based on data acquired inside Apple, that the incoming MacBooks will have SSDs as standard “boot drives,” for OS and application storage, and all the quick boot-ups and power-saving benefits. There’s also word that the mass of the laptops may have lightened by about half a pound–a saving that could easily be made by ditching optical drives, and improving chassis design (or altering chassis material–perhaps another hint that a novel colored alloy may be used). Further hints say the computers will sport a “larger” trackpad. This certainly tallies with changes to the MacBook Air, but there would seem to be little room for a bigger pad on the bottom portion of a MacBook in its current format. Unless, that is, you imagine that trackpad were getting a lot wider–to match with the proportions of a 16:9 aspect ratio screen. Digitimes, which has been somewhat accurate in its predictions in the past, is also hinting that alongside the expected MacBook refresh, a new line of iMacs may also be announced. The data comes from “supply chain sources,” adding an extra-official polish to the leak. And there’s one extra fact: Digitimes notes “changes over the screen size” have happened to “allow panel cutting to reach its optimization.” This suggests to us that the iMacs may adopt a 16:9 widescreen aspect ratio, in common to hints about the MacBook Pros, the actual update to the Air lineups and the fact that 16:9 is the HDTV format–something consumers are increasingly familiar with. We know Apple and Intel have been partnered for Intel’s upcoming Lightpeak technology–a potential successor to USB 3 that relies on fiber-optic connections for faster data sharing alongside power over traditional copper wire (even though Intel has downgraded the initial launch to a copper-only solution). There are serious rumors now that Apple may launch a novel new interface tech with its refreshed Macs. 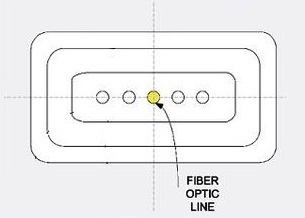 It’s also recently patented a system that has an optical connection among the metal connectors in its patented MagSafe plug/socket assembly. Meanwhile there are continuing rumors that there’s a novel new port on the upcoming iPad 2 design … one that may be compatible with a new connector type, and the rumor mill is now wondering if Lightpeak could appear on the iPad 2 too–it would significantly distinguish the iPad 2 among a growing number of iPad competitors. There’s a report on CNN today that Apple’s been in talks with record labels (alongside other online music vendors) to improve the quality of downloaded track that’s typically offered. When professional studios record artists digitally they tend to use 24-bit lossless audio formats that represent an extremely high match to the actual sound waves comprising the music. This is downsampled to be compatible with CD’s 16-bit technology (resulting in what’s technically a poorer match to the actual original sound waves, although you’d probably need to be a musical expert to note the differences) and then further downsampled and compressed into MP3s when sold through digital music stores. Now it seems Apple’s after the actual 24-bit masters for the tracks it offers, in order to deliver truly high-fidelity recordings at what would presumably be a premium price–it makes sense to keep iTunes fresh and interesting to audiophiles, and its the continuation of a policy Apple’s tried before, when it doubled its music bit rate in 2009 (also ditching DRM at the same time–for a price). Two rumors have surfaced that Apple may be delaying both the iPad 2 and the iPhone 5. One hints that production bottlenecks have slowed the iPad 2’s launch from a planned April date to a rumored June date. It’s possible, but we’re skeptical since Apple seems to have deliberately depleted its product inventory of the iPad right now–something it would only do if a refresh were imminent (think of the lost sales of millions of devices otherwise). A source close to Reuters agrees with us. The other rumor suggests a “July launch is unlikely” for the iPhone 5, because some chip vendors haven’t yet confirmed they’re ramping up demand to meet orders for new Apple products, and other supply chain agreements are apparently still in “flux”. The thinking is that a September date is more likely. Again, we’re skeptical about this–Apple’s suppliers can be very secretive, and while a few weeks delay is certainly possible we find it incredible that Apple would tolerate a slip of two months, since this could cede too much marketshare to Android. Update: Kara Swisher at AllThingsD is reporting, presumably from inside sources, that Apple’s got a March 2 event scheduled to launch the iPad 2. That would quash any notion the iPad 2 is delayed, and we could easily expect it to arrive in April.